It is the end of January and college admissions professionals are in the throes of putting together their 2015 class. Many spent the fall months traveling the country, meeting with prospective students, gathering and imparting information. Now we find ourselves in the crucial “Season of Yield,” where the final decisions will be made, both by the colleges and by the students. If you are feeling some stress about making your class, you are not alone. According to Inside Higher Ed’s 2014 Survey of College and University Admissions Officers, 47 percent of admissions leaders said they were very concerned about making their class (up from 46 percent last year) and another 32 percent reported that they were moderately concerned (up from 30 percent). Only 5 percent of admissions directors were not concerned at all. Working with admissions professionals across the country we have identified three very common mistakes that could be impacting your yield. Good news: Avoid these missteps and you will see greater success this year. Assuming that it is too early for student to make a college commitment, or taking for granted that a particular student you have connected with is definitely coming to your school, are big mistakes. Many admissions counselors tell us that it can feel awkward to call a student when they haven’t yet been officially admitted or received financial aid award information. If you don’t continue to have meaningful conversations with a prospective student now, at this critically point in the selection cycle, you are making a grave mistake. When you truly get to know a student as an individual, you make them feel valued and important. You also have a wealth of knowledge about that person that can guide you in your recruiting efforts. Now is the time to put that intelligence to use. Connect the prospective student to other students, activities and professors that will ignite their enthusiasm for your college. It is all about finding the right fit for each and every student. If you have done your groundwork, you will know if the student and the college are right for each other. You will also know how to best demonstrate that to the student. Continue the conversation on Twitter @LongmireCo. For more information about Longmire and Company’s Yield Enhancement tool click here. Successful admission professionals know that developing a connection with a student can greatly increase his or her commitment to the college and improve the likelihood of enrollment. In the midst of yield season, they know that strengthening that bond is crucial. We discovered in the preceding study, Your Value Proposition, that excitement about attending is a more powerful driver of college selection than cost or perceived quality of the institution. Excitement is an emotion that is rooted in how someone feels about the college or university. If the student does not feel that the college has taken a personal interest in them their level of excitement diminishes. 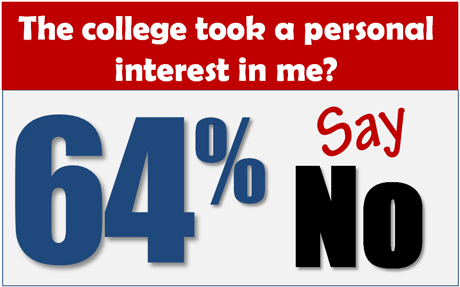 You may have heard the saying that “someone may forget what you said and forget what you did, but they will never forget how you made them feel.” Showing a personal interest in each student makes them feel good about the college and it has a strong positive correlation to yield. Smaller colleges have an advantage in that they can more easily establish a one-to-one connection with a prospective student but that doesn’t mean that large colleges that recruit thousands of students cannot also give prospective students the sense that the institution cares about them as an individual. This is typically done by providing great customer service so that students can easily get what they need, when they need it, from people who seem delighted to provide it to them. This commitment and practice has a measurable impact on yield. Longmire and Company uses our Service Quality Management (SQM) tool to regularly assess the pre-enrollment customer service provided to prospective students by colleges and universities, large and small. The impact on yield of delivering a high level of customer service is astonishing. SQM and the data collected in the Excitement Factor study show how important it is for an institution to deliver sustained and quality contact with students in each stage of the funnel. I can’t emphasize the word “quality” enough. It’s easier than you think to measure the pre-enrollment customer service that you’re providing and how it impacts your yield rates. Many of our clients go through the exercise of measuring customer service across all brand touch points so that they can make an objective case for change to all of the departments that are not providing an ideal, or at least acceptable, level of service. Most people who work on a college campus understand the need to grow or improve enrollment. They often just don’t know how to do it. That’s why we always say that if you don’t measure it you can’t manage it. Do you want to maximize yield? Measure and manage the way you communicate and respond to students and parents throughout the entire recruiting cycle. Do this and you’ll reap enormous benefits. Bob Longmire is President of Longmire and Company, Inc. He is a recognized expert on the topic of how prospective students and parents form their college selection decisions – and how colleges can use that knowledge to grow and control their enrollment. He can be reached at (913) 492-1265, ext 709 or at blongmire@longmire-co.com. 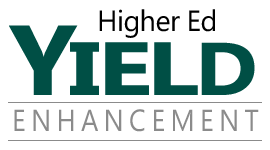 Yield Enhancement Series: Have Your Prospective Students Already Committed to Another College? When does yield season really start? It may be sooner than you think. Much sooner. As you can see on the graph below, nearly one-third of students make their final college selection decision before the end of March, and by the end of April that percentage rises to 57%. By May, 80% of students have made their final choice. From “The Excitement Factor!” A co-sponsored study by Longmire and Company. Our research uncovered that nearly 40% of students make their ultimate choice based more on their excitement about the college than facts about the school. What’s more, only 30% of prospective students consider cost the overriding factor in their college selection decision. So it’s likely that 70% of your pool will not be exclusively waiting to hear about your financial aid package before deciding which school is right for them. Many of your prospective students have formed an emotional connection to their college of choice long before you have firmed up any details with them. How can you know that? By asking them the right questions. We have found that the most successful admissions counselors build relationships with their students and gain valuable personal insight about each and every one of them. They know whether or not cost is the most critical factor and what attributes of their college will excite the student. With that knowledge in hand, they nurture a relationship with the student that best serves the needs of the individual. They stay in touch, ask questions and have meaningful conversations throughout the entire admissions process. And, they don’t get unpleasantly surprised in May when the student tells them he or she has opted for another college. One of our clients recently shared this great example with us. As enrollment manager, he challenged his team to maintain contact with key prospective students in a creative way. One of his star players emailed an article about the school’s outstanding performance in a national mathematical modeling competition to a prospective student who is passionate about math. In her follow up phone call she arranged to connect the prospective student with one of the contest participants. You can probably guess the rest of this story. The student later told his counselor that it was this arranged conversation that crystallized his commitment to the college, and that the counselor’s personal interest in him had confirmed this school was the right choice. Yield is simply a metric that in any other industry would be called a close ratio. If you’re a sales manager in any other industry and your close ratio isn’t where you want it be, you examine the effectiveness of your strategies and execution in both marketing and selling. Why should it be any different for higher education? In business-to-business or business-to-consumer marketing and sales the goal is always to understand the needs and preferences of the prospect and present the value of your product or service in the context what that consumer perceives as being valuable. Let’s stipulate that higher education is different in so many ways from other industries that sell products and services to consumers. With that stipulation, let’s also recognize that 4-year non-profit public and private colleges and universities continue to exist only when their income exceeds their expenses. Marketing serves to generate interest among prospective students but it can only go so far in converting interest into enrollment. At some point the sale needs to be made. In higher education, that most often happens when a prospective student interacts with an admission counselor, a faculty member, a financial aid representative, a coach, a campus, a current student or even another prospective student. It is these human interactions that have the largest impact on yield. And in so many colleges and universities across the United States, this is the area that is most often overlooked. Rather than focusing on all things that can be done to improve the interaction with prospective students and families during the college shopping process, so many colleges default to increasing the size of their prospect and applicant pools with the hope that an estimated increase in enrollment will justify the substantial cost of generating and processing an admittedly softer pool. The sad truth for many colleges employing this strategy is that they find themselves working even harder to process a larger pool of students with the same systems and personnel they’ve used in the past. That just puts additional pressure on an already pressured process. The solution is to focus first on what’s happening at ground level. How rich is your interaction with students in your naturally occurring pool? Are you providing great pre-enrollment customer service? Are your counselors well-trained to have the types of conversations that will generate excitement among prospective students about coming to your institution? Are prospective students having the types of campus visit experiences that will get them excited about your institution over all others? These are the essential practices that, when executed properly, ensure the highest yield from your pool of prospective students. Attempting to fit any new yield initiative on top of a malfunctioning base is a waste of time and resources. In this new blog series, we will provide information and examples of strategies and tools that can be used by any college that wishes to increase its yield efficiency using the resources that are currently available to them. Stay tuned. Bob Longmire is President of Longmire and Company, Inc. He is a recognized expert on the topic of how prospective students and parents form their college selection decisions – and how colleges can use that knowledge to grow and control their enrollment.He can be reached at (913) 492-1265, ext 709 or at blongmire@longmire-co.com.